The combined Columbia-Barnard Mathematics Department consists of 43 faculty members (28 senior, 15 junior), 16 adjunct professors, 14 Post-Doctoral Research Fellows and Scientists, and 60 PhD students. In addition, each year we have many short-term and long-term visitors that contribute to the intellectual activity of the department. Each of these sub-fields has at least one weekly seminar for faculty and PhD students. These seminars form one of the main training grounds for our PhD students. Because of this, by the beginning of the third year PhD students have sampled various fields and identified a topic in which they wish to specialize. The groups are fluid and faculty often are regular attendees in more than one seminar. There is constant communication between members of different groups, and as mathematical sub-fields and individual interests evolve there is a natural flow of faculty between the various groups. The number theory group contains both algebraic and analytic number theory as well as arithmetic geometry. It naturally overlaps with the algebraic geometry group which contains both complex algebraic geometry and algebraic geometry over fields of positive characteristics. The topology group consists mainly of low dimensional topology, including hyperbolic geometry, and the study of the topology of complex algebraic varieties. The latter has an overlap with the algebraic geometry group. 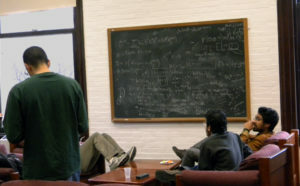 The geometric analysis group focuses on partial differential equations arising in geometry and physics, with a special concentration on evolution equations. The probability group has a strong representation in stochastic processes and theoretical Mathematical Finance, and has some overlap with the geometric analysis group. Lastly, the mathematical physics group is concerned with the interaction between mathematics and recent developments in high energy mathematical physics. This group overlaps with the topology, geometric analysis , and algebraic geometry groups. In addition to regular weekly seminars, the department has a variety of special seminars and activities each year. In addition to the occasional conference hosted by the department, there are also special seminars and lecture series. Each year the department hosts at least one Eilenberg Visiting Professor. This is a distinguished senior mathematician in residence who gives a series of talks on a subject of interest to a wide variety of people in the department. There are also the Joseph Fels Ritt Lectures; a series of two lectures given by a mathematician from outside the department and designed for a broad mathematical audience. Yet another special lecture is the Ellis R. Kolchin Lecture, which is a single talk delivered by a guest lecturer. Finally, each year the Department hosts the Minerva Research Foundation Lecturers, which provides a series of talks in the field of Probability Theory.